Springtime in Oregon reignites a certain shoutout heard far and wide: “Let’s Go Outdoors!” It’s also the name of a popular Oregon Parks and Recreation program that teaches outdoor skills such as camping, hiking, crabbing, clamming, paddling, cycling and disc golf. It’s hard to beat the outdoors experiences at Fort Stevens State Park where you can touch Oregon history with an easy hike into a concrete bunker deep in the ground. Find the fort at Fort Stevens by following Park Ranger John Koch through a locked gate and into the darkness for a stroll underground. 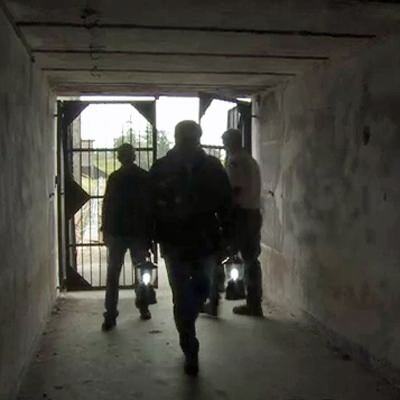 The free guided tour of Battery Mishler is chilly, damp and dimly lit, but it is a place where you can see and touch Oregon’s military past. A century ago, Battery Mishler was a part of a Columbia River Harbor Defenses that included multiple gun batteries located on both sides of the Columbia River. Battery Mishler was the only underground battery at Fort Stevens, housing two 10-inch guns pointed to the sky. Each gun was mounted on disappearing carriages, which hid the guns behind concrete and earth walls. The guns could fire 617-pound shells at a distance of nine miles. The tour takes you past hallways and rooms and interesting features such as a massive underground gun pit. The huge gun was mounted atop a large, thick concrete pillar. It’s a tour that takes your breath away and captures a remarkable century-old moment in Oregon’s past that’s part of Fort Stevens State Park’s remarkable ‘Let’s Go Outdoors’ program. ‘Let’s Go’ connects folks itching to get outdoors and try something new — not just a history hike — such as mountain bike tour or a game of disc golf in a forested setting like L.L. Stub Stewart State Park. 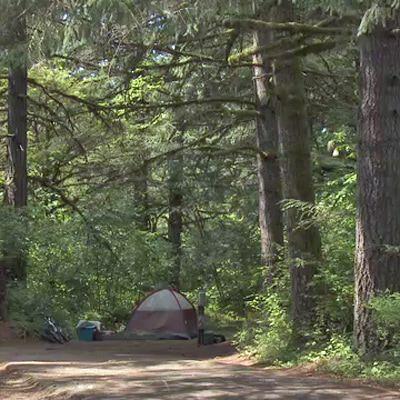 Today there are scores of events that take place state parks across Oregon. 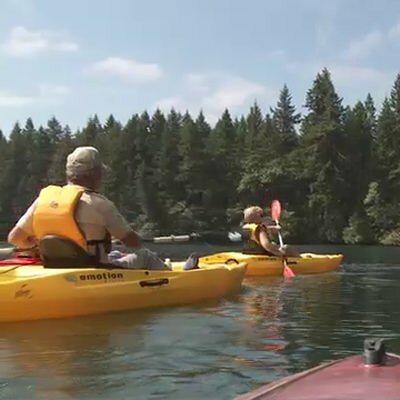 The activities are affordable, easy and teach you something new like a paddle trip across Estacada Lake at Milo McIver State Park. Recently, we joined a small group of first-time paddlers and their lead guide, Andrew Brainard, who provided paddles, life vests, stable flat-water kayaks and plenty of solid instruction. “Estacada Lake is calm water, there are no obstacles for us so it’s a leisurely place to paddle,” notes Brainard. 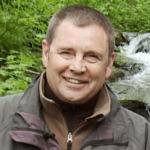 The idea is to give the novice kayak user an introduction to kayaking and a chance to experience the Clackamas watershed from a different point of view. Smith adds she was also impressed that the lake and park are only 45 minutes from downtown Portland and yet a world away from the city hub-bub and noise. The ‘Let’s Go’ program is paying off too. Visitor day use and overnight campouts have climbed as much as 15 percent at some state parks annually over the past eight years. You’ll be going too! The wealth of Let’s Go Outdoor adventures is too hard to resist — so check them out and get out here soon.